Leadership legacies lie dormant in many generations and/or lineages. They are either never cultivated or they are buried beneath loads of generational curses that are attached to roots in an unseen realm which no one will deal with. The blood flows through veins in an unseen realm of the body and holds the DNA, which makes us who we are. It has been argued for centuries which is the more powerful – nature or nurture. A child can be taken from an orphanage and placed in a good home only to have the DNA of the biological parents trump the good that the adopted parents did. On the flip side, a child with good genes can be exposed to much ugliness and still weather the storm to come out okay in the end. This is the power of nature. We’ve also seen someone with a lot of DNA baggage in the blood who, given the chance and proper godly nurturing, comes out the other side different than their generations before them. This is the power of nurture. The debate could be put to rest by acknowledging that both are important. I believe it takes both working together – nature and nurture. A piece of steel may be worth $5. Make it into horseshoes and its worth is $10. Backtrack! Manufacture sewing needles out of it and the value rises to $350. Better yet, use it to make springs to power Rolex watches and the value skyrockets to $250,000! The raw material remained the same – a hunk of steel. You’ve been given the same thing – raw material in the form of DNA. So, you have a spirit that cries out for God but a nature that desires destructive behavior. What do you do? Jesus didn’t pick the perfect lineage to be born into. Yes, Mary was a virgin, but she and Joseph’s lineage was far from perfect. It was a beautiful blended mess. Christ can give you a new nature, but how will you nurture it? My Dad taught me, “If you can be stopped by any excuse, the devil will make sure you always have one.” No more excuses. 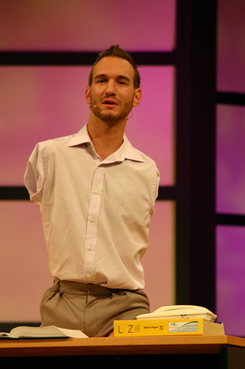 Nick Vujicic was born with no arms or legs but is now one of the most sought after speakers in the world, speaking over 300 times a year, changing his generation. He has no limbs. What do YOU not have? He has heart. He has new DNA from Christ. What do you have? You can call your DNA deoxyribonucleic acid; or you can call your DNA Divine Nature Acquired! You have a chance at new life through Christ. Well? This is brilliant! I love the way you brought this together. This has been on my heart lately. Great way to present this PK! !